Cooper Webb revealed the startling contrast a year has made at the same stadium in Minneapolis after his third win of the 2019 season. 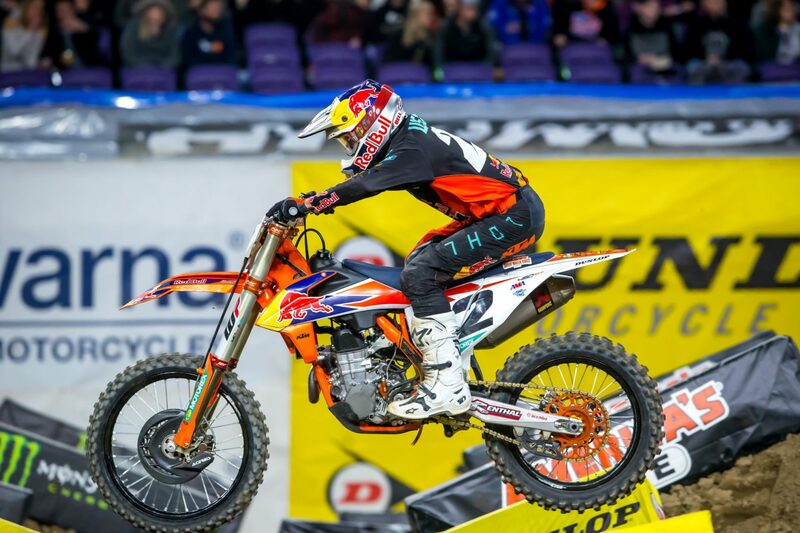 Webb is just a point of the championship lead, now held again by Ken Roczen but has won more races than any other rider this season after switching to Red Bull KTM and training with Aldon Baker. Last he year sat in the medical centre with yet another injury and out of the race and the championship hunt. “Man, I’m stoked, I really am. I sat here in the Asterisk Rig [Mobile Medical Unit] the last two years, one with a blown-out shoulder, and last year with with a broken leg. And last year I contemplated a lot sitting right here in this very, exact stadium,” revealed Webb. “To get three wins this year is pretty spectacular, especially bouncing back from last week – having that bad race in the mud – but I never lost belief, never lost faith and knew I was still good,” commmented Webb on an impressive rebound following a difficult day in the mud at San Diego. Video: Webb/Roczen battle to the finish!